The institution has an Admission Board who considers all applications received from prospective students. Candidates seeking for admission should either fill out our Online Application Form or request for our Application Form from our Head Office at 32 Adeshina Street, Ijeshatedo, Surulere, Lagos. The admission form should be properly filled and also duly endorsed by the students’ parent(s) or guardian(s). The form should be returned to our Head Office accompanied by photocopies of certificates, testimonials, two passport photographs and a specified registration fee. All successful applicants will receive an acceptance letter and other details from the institute. The Admission Board has all rights to reject any application and they are not bound to offer any explanations for doing so. 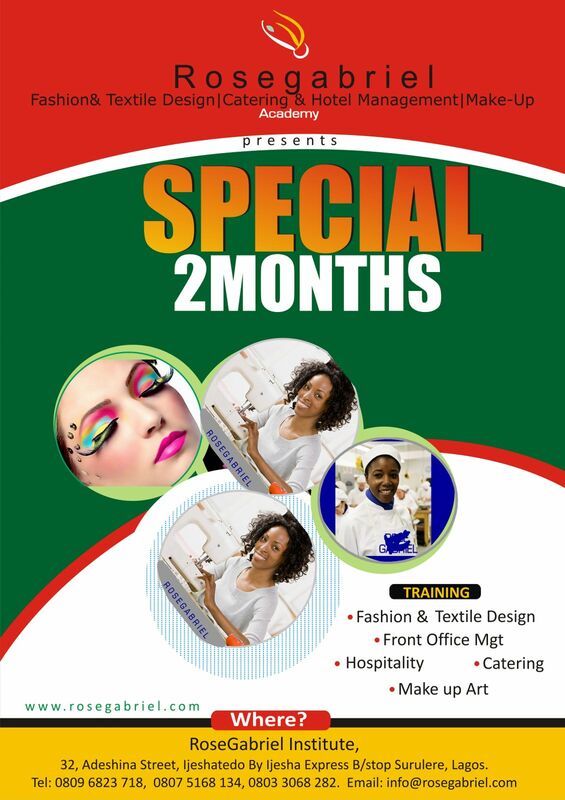 The qualification and experience required for the courses are stated under each course. The Admission Board reserves the right however to be flexible in case of requirements for admission. A student who does not possess the requisite qualification could still be invited for an interview. When he or she is able to satisfy the Board, admission may still be offered. Applicants may be called in for tests and interviews. As soon as a student has been offered admission, all fees and other charges which would be specified are to be paid at least a week before the commencement of classes. This is a very strict regulation. However, the Admission Board may bend backwards on this. A student who does not effect the payment of all fees and other charges on time may be suspended or sent out of classes. DEBTOR STUDENTS WILL NOT BE ALLOWED TO TAKE ANY EXAMINATIONS. The non-refundable registration fee paid by all the students does not form part of tuition fees. No refund of whatever payment will be made in case of expulsion of students for poor and unexemplary conduct or refusal to attend lectures. ANY FEES PAID ARE NOT REFUNDABLE. The institute’s holiday may be in line with that of the government. This will be announced from time to time. No student will be allowed to transfer his or her registration to another student. Changes of courses by students may be allowed only at the approval of the School Board of Directors. All students are encouraged and expected to sit for both Internal and External Examinations. The institute will help students to identify external, professional examinations that are of relevance to our requirements. The institute may make bulk purchase of essential text books to sell to our students at minimal costs. Students are expected to be good and exemplary at behaviour at all time. All institute regulations should be strictly observed. Disobedience, insubordination, acts of indiscipline and absenteeism may earn students suspension or expulsion. And in case of rustication, no refund will be made. The minimum requirement is Teachers Grade II Certificate or J.S.S III or S.S.S III or equivalents However, because of the aim of the course which is to impact participants with skills for their own business, lower qualifications such as First school leaving certificate or equivalents may also to be considered. Matured students can also apply. Age is no barrier. The institute reserves the right to amend by way of deletions or additions to this prospectus. And whatever revisions may not be consistent with the provisions herein. However, in all matters, interpretation strictly remains at the discretion of the governing board.